We’ve grabbed our popular Club Chair from the Peepshow Skybox and added a ton of animations, 7 new fabric colors, and created a custom Round Endtable with 20 fabric drapes to go with it – and you can grab them for only $L95 each this week only at the Trompe Loeil mainstore! Our Club Chair is crafted from comfortable worn leather, curved in all the right places, and makes a fantastic centerpiece for your living room, den or office. Pick up a brown, black, or red version for a traditional look, or go nuts with our teal, purple, and blue versions! There’s 8 leather colors in all, and for our release week only, they’re $L95 each – so you can pick up all your favorites! Our Round Endtables fit beautifully with the Club Chairs above, and they’re scripted with 10 fabrics included with each! 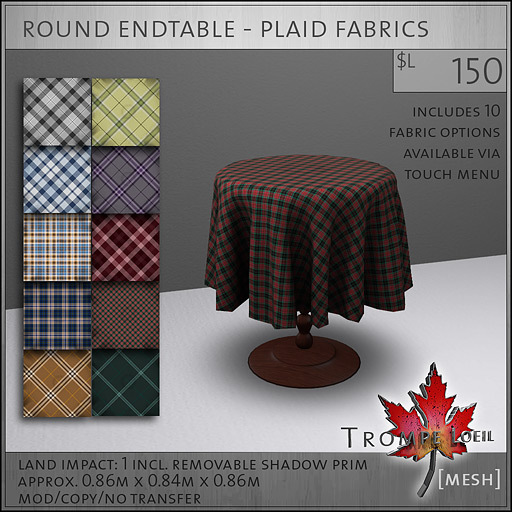 Pick from the Plaids or the Morning Light fabrics (which match our popular Cupboard Beds and Bathtubs), and owner-only click on the drape to choose your favorite pattern from the menu! 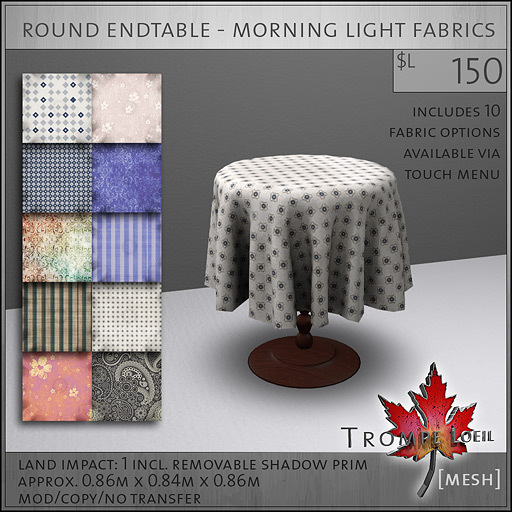 The Round Endtables are also on sale for this introductory week – only $L95 each! 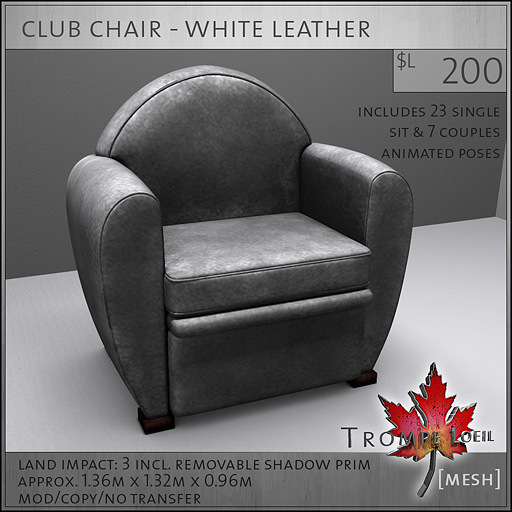 Swing into the Trompe Loeil mainstore before October 28 and grab your favorites on sale!